I ecoprint on both fabric and leather and the results are unique. I first collect various leaves and foliage from my NC farm and through a natural process, imprint them onto leather. I handcraft the hides into handbags, journals, shoes and clothing. (watch for more!) The colors you see are the actual colors Nature released to me that day as I imprinted my pieces and the beautiful blue is from logwood. 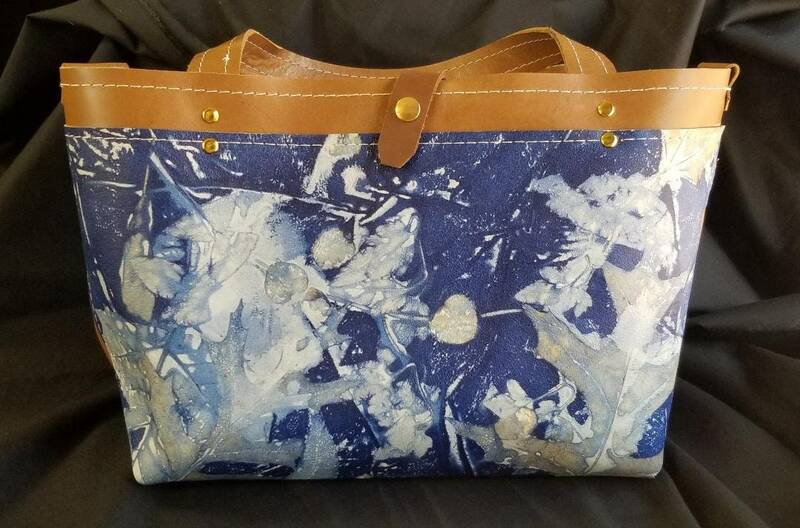 This unique handbag showcases my ecoprinted design on the front, showcasing the gorgeous Coffee brown leather of the bag. The bag itself is 9" high x 12" wide by 4.5" deep, a perfect size for carrying what you need! Handcrafted by me and finished with stylish brass rivets and a snap closure and two handles for carrying ease.